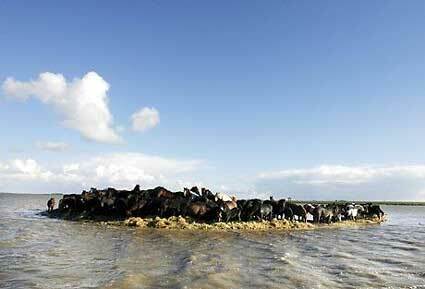 Rescue workers near the Frisian town of Marrum (145 kilometers northeast of Amsterdam) struggled yesterday to save a herd of one hundred horses stranded for days on a tiny island after a storm earlier this week turned their pasture into sea. 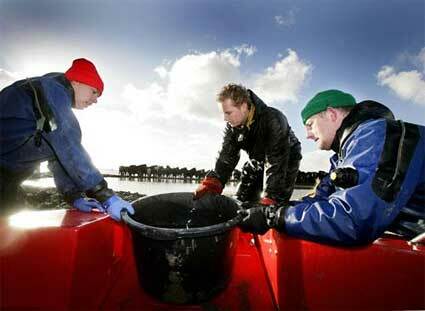 Eighteen horses have already drowned, and the rest have spent two nights huddled together in knee-deep water. No more horses have died last night, and the remaining horses are healthy, according to vet Marten de Vries. The wind has dropped and so has the water, by sixty centimeters. Since yesterday boats from the local fire department have been going back and forth to bring water and hay to the marooned animals. Thus far attempts to save the stranded horses have failed. On Wednesday, Marrum’s fire department used small boats to ferry twenty small horses to safety. On Thursday the Dutch army tried to rescue the rest of the herd by building a bridge of pontoons, but called off the operation when water levels receded in some places, grounding the pontoon boats. The town’s mayor considered using helicopters to transport the poor animals, but decided the noise and lights might panic the horses and cause more to drown. Emotions among spectators on the nearby dike flared Wednesday when horse owner Piet Lootsma arrived, resulting in a small riot. Witnesses had told the media earlier that day that Lootsma had never particularly been precise when it came to the well-being of his horses. More people expressed their concerns about the horse owner on Thursday, and the Dierenbescherming (Dutch animal protection group) has said that they will press charges against him. Angry eyes are also turning toward the Frisian town of Gea, responsible for the system of dikes in the Noarderleech area. As described in their contract with the tenant farmers, they should have made them move their livestock inside the dikes by 15 October. According to director Hosper, owner of the Noarderleech area, those contracts are more like guidelines, really. This morning rescuers decided to start the final rescue operations at 1:30pm local time today. The horse rescuers will try to get the horses to walk or swim to shore, a distance of over 500 meters, although there are concerns that the animals could become ensnared in submerged barbed-wire fences. The trip could become fatal for some of the weaker horses. This entry was posted on Friday, November 3rd, 2006 at 2:11 pm CET and is filed under Life in Holland, Nature	with tags . You can follow any responses to this entry through the RSS 2.0 feed. You can leave a response, or trackback from your own site. 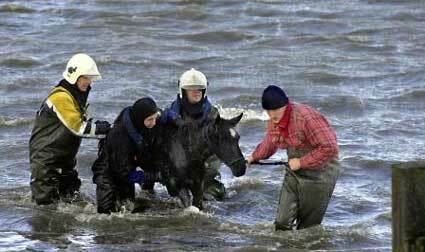 There was a happy ending to this story as all horses were saved later this day, by guiding them through the water. I’m sorry, but 60 of these horses were subsequently slaughtered and ended up on the dinner table. where the women who went for the horses acknowledge for their courage? Where did the information about 60 horses being slaughtered come from? That is so amazing, and Robert Birney, your a jerk……. That was so wrong of you to post that……. But anyways you guys are so awesome, the ppl that helped out………….. GOOD GOING!!!!!!!!!!!!!!! These images are wonderful. Who does the copyright belong to? Would it be possible to use them in an educational pack? Please contact me if you might be able to help at images@wspa-international.org. Thank you. I think my horse could possibly have been bred by Piet Lootsma in 2003 (it says A.Lootsma on his passport and in this area but all other fields are Unknown) does anyone know wha happened to him? Were the horses taken off him and sold? This would explain why my passport is so blank!